(It happens). If there is a problem, we can work together to resolve it. (It happens). November 13. If there is a problem, we can work together to resolve it. Sci-Fi & Fantasy Models magazine issue 30, good condition. 'SCI-FI & FANTASY MODELLER'. 10" X 8" SOFT COVER BOOK. FOR QUALITY, SERVICE AND VALUE. The miniature SF-FX of 'Avalanche'. Genre: Sci-Fi. Film series: Back to the future. This issue contains the cylinder head cover and thermostat. Scale : 1:8. Issue # 21. Type: Build-up model. Product Details-. FACEHUGGER FROM ALIENS. SCI-FI & FANTASY MODELS. LOADS MORE. Building the Lindberg ID4 Alien Exo Skeleton. Scratchbuilding the Lost in Space pod. Scratchbuilding a Star Trek communicator. Sci-Fi & Fantasy Models Magazine Issue 23 October 1997 Frankenstein Reborn plus much much more. 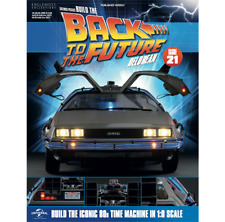 From Sketch To Screen Science Fiction Fantasy Models Miniatures Film TV and How They Are Created Paperback book. Lots if photos and details. For a list if contents please see photos. Condition is Used. Small tear at bottom of back cover. Name written inside front cover. Please see photos. Dispatched with Royal Mail 2nd Class. 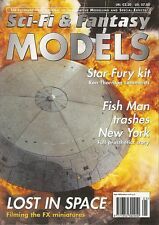 Sci-Fi & Fantasy Models magazine issue 28, good condition. Sci-Fi & Fantasy Models magazine issue 4, good condition. Sci-Fi & Fantasy Models magazine issue 18, good condition. Sci-Fi & Fantasy Models magazine issue 24, good condition. 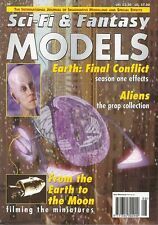 Sci-Fi & Fantasy Models Magazine Issue 25 Mar 1999 Borg, Proteus, S:AAB 1:1 Kit plus much much more. SCI-FI & FANTASY MODELS. Content are a S f & f typo it should read 23 but says 22. 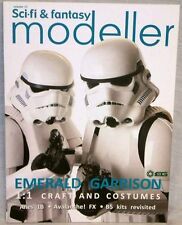 “SCI-FI & FANTASY MODELLER ”. Scratchbuilt studio scale TIE Bomber / MaK Fireball conversion / Futura 27 - Scratchbuilt spacegoing car. 10" X 8" SOFT COVER BOOK. N.B. ALL IMAGES (EXCEPT THAT OF THE PRODUCT) ARE FOR REFERENCE ONLY WHERE APPLICABLE. “SCI-FI & FANTASY MODELLER ”. 1:1 Star Trek Nomad Probe/UFO Lunar Module resin kit review. 10" X 8" SOFT COVER BOOK. N.B. ALL IMAGES (EXCEPT THAT OF THE PRODUCT) ARE FOR REFERENCE ONLY WHERE APPLICABLE. FEATURES MAD MAX’S FORD FALCON MODEL KIT. RARE MODEL MAKERS’ MAG. Produced and edited by Mike Reccia. Part of a general clear out of my old books and magazines. The magazine is within pictorial card covers.